Debunkery- Left Brained vs Right Brained? Welcome to Debunkery! The topic of the day is: Cognitive Hemispheric Dominance (CHD). The idea that the left hemisphere of our brain is one way and the right is another, and that the differences impact one’s personality. Many people believe that the left brain deals with logic, rationality, deduction, ect. While the right side wants to be creative, intuitive, and “go with the flow”. But how much merit does the idea of CHD have? The concept that we are two halves of a person jammed into one skull, goes as far back as humans do. The inner struggles we have are identical to those humans had thousands of years ago. But is there a strict separation between the hemispheres? And do genetic or environmental factors force us to dominate with one while neglecting the other? In short… nope. The brain is a dynamic organ, unlike any other. It not only adapts to the changing biological influences around it, but it learns. It even learns how to learn! It grows in ways we can’t fully understand yet. Therefore, every brain is different, not unlike snowflakes. However there are general localized functional areas that brain structure must follow; the frontal lobe deals with attention and higher reasoning; the occipital lobe deals mostly with processing visual input; the list goes on. There are even processes that can be mostly controlled by one lateral half or the other. Language and math for example were thought to be left hemisphere dominant in everyone’s brains. In my opinion, this is where the myth of personalities being left or right brained stems from: One’s brain can store a function like doing math, in the left hemisphere, as it is in most people. Or it can be stored in the right brain, as it is in a smaller percentage of the population. This difference is only detectable from an fMRI, and it plays no perceivable role in defining our personality. It might be more easily explained by using Situs Inversus as an analogy. This condition reverses the bilateral placement of ones major organs. The heart, lungs, stomach, all of it, are set in the mirror image of what one would expect. These individuals function completely normally, and the condition is often undetected unless another issue leads to its discovery. 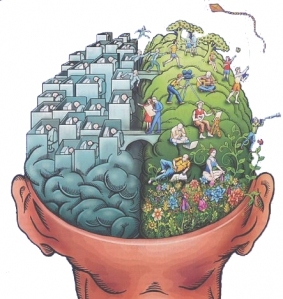 The left/rightness of the brain is the same way. One may store language function in the left or the right hemisphere, it makes no difference. Language, like the heart, is generally kept on the left hand side however. Math or language skills are not any more or less ‘dominating’ than dexterity or musical talent; and therefore left/right “dominance” is not applicable wording. Perhaps if as a group, scientists chose a trait, one usually confined to a single hemisphere; then statements like, “My right/left brain houses the majority of my language/math skills.” Would have some context. But simply stating “I’m left/right brained” has no biological basis. In addition, the idea that which side of your brain stores a particular function, plays a measurable role in your personality, has been shown to be false. So, I’m afraid the personality tests about your left/right brain-ed-ness, that you suspected were crap, are indeed crap. While there is certainly asymmetry in the brain, conclusions determining your personality cannot be drawn from them. And if they could, you’d need an fMRI to measure such asymmetries. Due to a typo in the above email address, you may have received an error message when trying to send suggestions. If that has been the case, my bad. Please resend it and thanks for your support!